PopCap has gone and rolled out new introductory trailers for five of the Masters featured in Peggle 2. First up is Gnorman, featured in the video that sits at the head of this post. This Peggle Master makes use of the Uber Bolt, an attack that electrically charges the ball to reach the two pegs nearest to the one it touches. This gnome driving a robotic gnome will be useful for clearing tough levels. Next is Luna. This ghost girl can use Night Shade, an ability that turns blue pegs into ghost pegs that can be cleared without causing a change in direction. Shoot straight through them to hit orange or green pegs. The video below shows off the now classic Bjorn the Unicorn. Bjorn's power lets him offer up a much more precise shot path with his Super Guide. This one is incredibly useful for style shots. Next is Berg the yeti. His power freezes the board and makes pegs slide after being hit in order to further chain reactions. Sounds awesome. Finally, we have Jeffrey. This Peggle Master can toss a massive boulder that wrecks pegs in massive style. 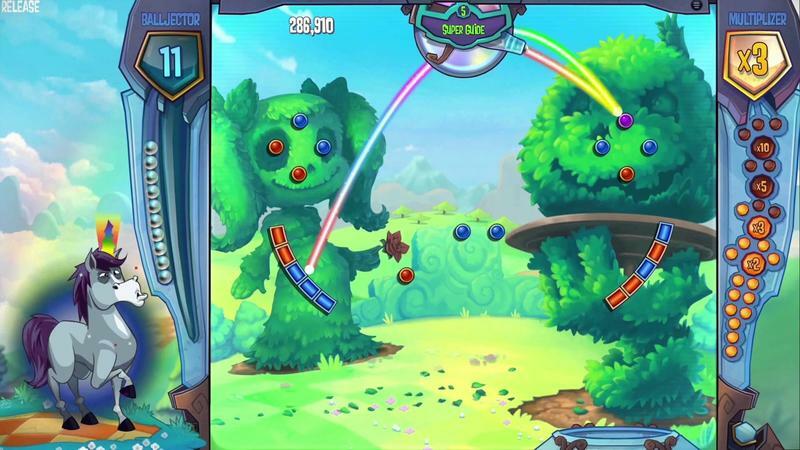 Peggle 2 will drop on the Xbox One first on December 9th. That news was a rumor yesterday, but PopCap cleared things up with the tweet you see above. I'm super psyched for Peggle 2, how about you?